Over a thousand years ago on the shores of Onondaga Lake, in present day central New York, democracy was born. The Seneca, Cayuga, Onondaga, Oneida, and the M ohawk people had been warring against each other and there was great bloodshed. These people (the 5 nations) had forgotten their ways and their actions saddened the Creator. The Creator sent a messenger to the people so that the 5 nations could live in peace. The messenger the Creator sent is referred to as the Peacemaker. The Peacemaker carried the powerful words of peace to the 5 nations. The Peacemaker traveled in a stone canoe to show to these troubled people that his words are true. In order for the Creator's message to spread, the Peacemaker sought out the most evil people of the 5 nations and named them as leaders. The most evil person was an Onondaga named Tadadaho. Tadadaho was said to be so evil that his body was twisted and snakes grew from his head. The Peacemaker's message had spread and changed all of the people. One of the people who had accepted the good words of the Creator and decided to help the Peacemaker was Haionwhatha (Hiawatha). Tadadaho was determined to stop this message and its messengers. Tadadaho then went and killed Hiawatha's daughters. Grief stricken, Hiawatha was no longer able to spread the Creator's words. While grieving, Hiawatha found words that would help console others who lost loved ones. He devised a method to remember these words by stringing purple and white fresh water clamshells together on strings. Hence the first wampum was made. Once Hiawatha's mind was clear, he and the Peacemaker were able to confront Tadadaho again. This time they had the support of 49 other leaders from all of the five nations. It is at this point when they combed the snakes from Tadadaho's hair and he accepted Creator's message and became the 50th chief. They symbolized this union of peace by uprooting a great white pine tree and threw their weapons of war into the hole left by the uprooted tree. They replanted the tree and the Peacemaker placed an eagle on top to warn the Haudenausanee (People of the Longhouse) of any dangers to this great peace. Wampum belts were made to record the event. The Peacemaker then set in place a method for our leaders to be condoled (set in place.) He selected women to be the leaders of their clans. The leader will be called Clan Mother. The Clan Mother will then select their spokesman and leader for their clan called a Chief. When either leader passes away, the clan then selects another to sit in their place. This process has continued at Onondaga for countless centuries. The Chiefs and Clan Mothers at Onondaga still sit and meet today in the Longhouse. The names and titles of the men and women that the Peacemaker set in place are still used to identify our leaders. 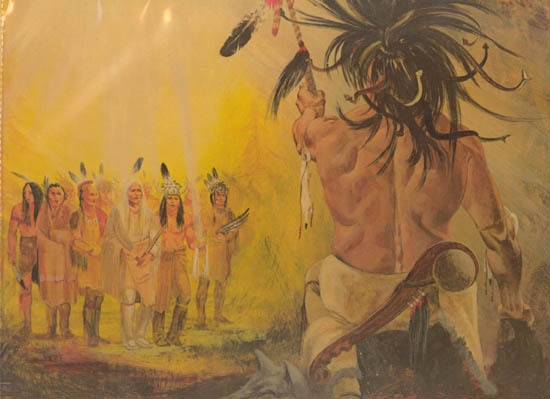 At Onondaga, Tadadaho and the other Onondaga chiefs still sit and discuss and make decisions for the benefit of the Onondaga people. Onondaga and the other nations of the Haudenosaunee have a unique position with the United States of America. 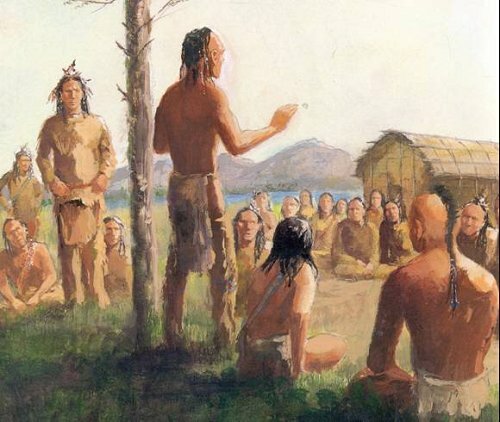 The Onondagas and the Haudenosaunee have been making agreements with other Native Nations, the Dutch, English, and the French long before the formation of the 13 colonies into the United States. Then when the United States first formed, President George Washington made an agreement of peace and friendship as nation to nation and a wampum belt was made. From that day in the late18th century, the Onondaga Chiefs, Clan Mothers, and people have maintained this relationship of an equal and separate nation from the United States.